Over this past Fall, I've had the opportunity to see several similar requests and have developed a couple related solutions associated with down-converting Excel 2007/2010 .XLSX files to Excel 2003 .XLS files http:/Q_27289693.html, and also converting Excel 2007/2010 .XLSM files to .XLSX files http:/Q_27323432.html. After constructing the first solution, it only required a couple tweaks to create the second. I thought it would be a good idea to take my solution and create a more generic utility to help us navigate between different Excel version (2003, 2007, 2010) and enable elimination of macros, as well. This article focuses on delivering a utility to convert Excel files in a folder from .XLS, .XLSX, or .XLSM to .XLS, .XLSX, or .XLSM with an option to remove macros as part of the process. 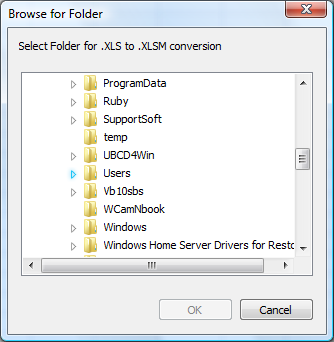 While converting to .XLSX automatically removes all macros, it may be the user's desire to sustain the same file extension without macros (e.g., from .XLS to .XLS or .XLSM to .XLSM). To eliminate macros programmatically, and to help out with folder browsing API's, I leveraged tips from Erlandsen Data Consulting, http://www.exceltip.com/show_tip/Modules,_Class_Modules_in_VBA/Delete_all_macros_in_a_workbook/document_using_VBA_in_Microsoft_Excel/505.html, and http://www.exceltip.com/st/Select_folder_names_using_VBA_in_Microsoft_Excel/449.html. I also leveraged a tip from Ken Puls at http://www.excelguru.ca/node/30 to check for file existance. Just download the attached file, select the Search for file type, and Convert to file type, select from the 3 options: Remove Macros, Silent mode (auto overwrite), and Silent mode (auto delete), then hit the Loop and Convert command button to initiate the process. You will then be prompted to select a folder. The application searches that folder for the Search file type. If you have not selected any of the Silent Mode options, you'll be prompted with the number of files found, and to proceed/cancel. If the Convert to file exists already, you would be prompted to overwrite that file/cancel, and whether you'd like to delete the old file after conversion. If you run in silent mode, the application can assume you want to delete old files after conversion, and to overwrite existing files during conversion. While this app has seen some testing, its always best to make a backup of your folders and test the app out for yourself. Especially on mass conversions, until you're satisfied everything's working the way you think it should! There are some "wrinkles" in the conversion process - recall converting Excel 2007 or 2010 files to Excel 2003 files is a down-conversion, hence some of the features, formatting, and capability could be lost in that conversion. Having a backup, or not choosing the automatic delete feature on the old files during conversion may be a wise choice, which allows you to examine your converted files ahead of a manual delete process. At the end of the process, you will be advised the # of successful conversions. MsgBox "You didn't select a folder", vbCritical, "Aborting!" MsgBox "There aren't any " & fromFormat & " files in the " & fPath & " directory", vbCritical, "Aborting"
If UCase(Right(fName, Len(fromFormat))) = UCase(fromFormat) Then 'to differentiate between dir *.xls and inadvertently get *.xls??? Loop Until fName = ""
killOnSave = False 'already false, but just a reminder this is in here! 'you could also check to see if the save as file already exists, before you open convert and save on top! MsgBox "For some reason, could not open/save the file: " & fPath & "\" & fName, vbCritical, "Aborting!" To enhance this further to your needs, it should be easy enough to modify this to add additional conversion types (e.g., Excel 97/97, 2000, CSV, etc. 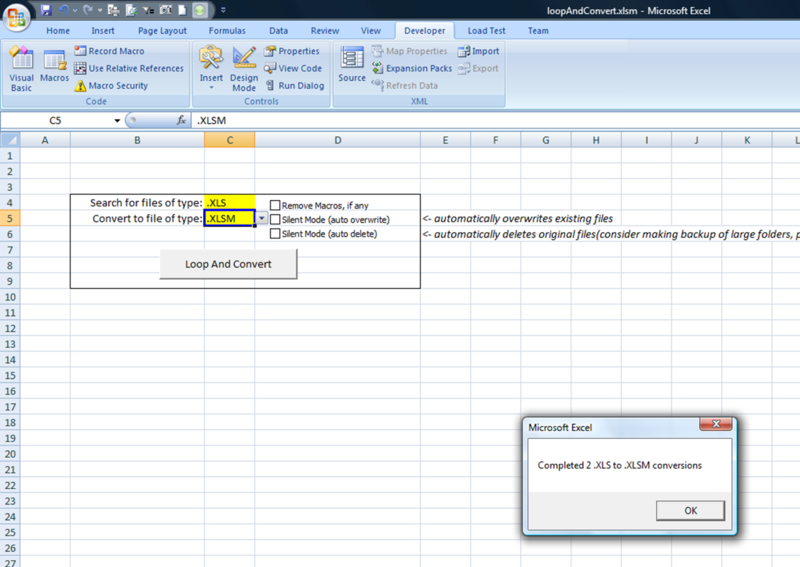 ), whilst modifying the drop downs on the Control Panel tab of the workbook. Attachment: Attached, please find the loopAndConvert.xlsm workbook that contains the entire codeset. I hope you enjoyed the article, and can get some time-saving benefit from the utility.